Why Is Congress Afraid of This Six-Step Plan to Reduce the Debt? The Simpson-Bowles deficit reduction plan is a 2010 bipartisan report on the best way to fix the U.S. national debt. It offered six steps to lower the budget deficit to 2.3% of gross domestic product by 2015. It would have reduced the debt by $3.8 trillion by 2020. As a result, the debt-to-GDP ratio would have dropped to a healthy 60% by 2023 and 40% by 2035. Congress never adopted it. Instead, Congress chose sequestration and the 2013 fiscal cliff crisis. Opponents wouldn't cut Social Security and Medicare benefits or defense. Others wouldn't touch the mortgage interest tax deduction. Why were such painful cuts necessary? Because the U.S. government must borrow $0.37 for every dollar, it spends. The debt is more than the entire output of the U.S. economy in a year. Most of the budget goes to $1 trillion in Social Security benefits, $886 billion on the military, and $625 billion on Medicare. The interest on the debt is $363 billion. It leaves little for investments in the country's future. These include education, NASA, and infrastructure. Cap government spending at 21% of GDP. Reduce federal health care spending. End $1.1 trillion in tax loopholes, thus increasing government revenue to 21% of GDP while lowering tax rates. The Committee suggested waiting for two years before cutting spending or raising taxes. It wanted to make sure the economy had fully recovered from the Great Recession. The Simpson-Bowles Report made clear, specific, and realistic recommendations to achieve deficit reduction. Most of its ideas are well-regarded policies that economists have advocated for years. Congress hasn't adopted them because they are politically difficult. Cap government spending at 21% of GDP. All agencies must reduce discretionary spending to 2008 levels, adjusted for inflation, by 2013. After that, cap spending increases at half the rate of inflation. It includes military spending. It also includes a separate limit for spending on wars, as needed. Budget emergency and disaster spending at recent annual averages. Pay for the Transportation Trust Fund with a $0.15/gallon gas tax. Cut the White House budget by 15%. Freeze all government worker pay, including defense. Cut the federal workforce by 10% through attrition. Reduce mandatory spending. Reduce federal retirement benefits (including military) by $70 billion over 10 years. Reduce farm subsidies, school loans, and the State Abandoned Mine Fund. Allow the Post Office to run as a profitable business. Permit the Pension Benefit Guarantee Corporation to raise premiums. Let the Tennessee Valley Authority charge market rates for its electricity. No changes to Supplemental Security Income, food stamps, or unemployment benefits. Reduce federal health care spending. Focus Medicare payments to physicians on quality of care instead of quantity. Freeze physician payments through 2013. Institute a 1% cut in 2014. Increase funding to reduce Medicare fraud. Reduce excess Medicare payments. Coordinate Medicaid and Medicare benefits. Reduce medical malpractice costs. The Affordable Care Act incorporated many of the suggestions. Make Social Security sustainable. Lower the benefits for higher income earners. Increase the normal retirement age to 69 by 2075. All workers must pay Social Security taxes on the first 90% of income up to $190,000 by 2020. (It was $168,000 when the report was written). Workers who have paid into the system for at least 25 years are guaranteed a minimum payout of 125% of the poverty level. Cover newly hired state and local workers after 2020. End $1.1 trillion in tax loopholes, thus increasing government revenue to 21% of GDP while lowering tax rates. Lower the income tax rates to 12%, 22%, and 28%, and lower the corporate tax rate to 28%. To achieve these rates, tax capital gains and dividends as ordinary income. End the Alternative Minimum Tax and itemized deductions. Tax state and municipal bonds. Tax the following exclusions at higher income levels: health insurance benefits, retirement accounts, charitable giving, and mortgage interest. Use chained Consumer Price Index to measure cost-of-living increases for recipients. The report eliminated 150 other income tax loopholes, corporate tax subsidies, and deductions. Various Process Reforms. Use the chain-weighted consumer price index for all government cost-of-living payments. The president's budget must show no deficit by 2015 unless there is a recession. Calibrate extended unemployment benefits to a general unemployment rate. The Simpson-Bowles plan would have reduced the deficit and debt with a carefully considered list of detailed recommendations. Although many critics worried about the tax hikes, this would not deter economic growth once GDP reached a healthy 2%-3% rate. Why? Tax cuts only spur growth when rates are above the 50% level according to the Laffer Curve. It's the theoretical underpinning of supply-side economics, the policy that supports tax cuts. The plan also protects those who are most vulnerable, the very poor and elderly. They are most likely to spend any income they receive. It emphasizes automatic benefit increases for the unemployed. The Congressional Budget Office found it's one of the best ways to stimulate demand and increase jobs. Simpson-Bowles recommends that all agencies reduce spending at the same percentage. It forces agency heads, who are best qualified, to find savings in their departments. The plan also ended spending on outdated programs, like the Abandoned Mine Fund. All in all, it is a workable plan from an economic perspective. The National Commission on Fiscal Responsibility and Reform submitted the final report on December 1, 2010. The co-chairmen were former Wyoming Republican Senator Alan Simpson and Democrat Erskine Bowles, President Bill Clinton's chief of staff. 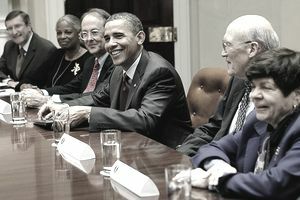 President Barack Obama formed the Commission on February 18, 2010. His goal was to find a bipartisan way to lower the annual federal budget deficit to 3% of GDP. Obama asked for a balanced budget by 2015. This did not count interest payments, though. He also required a solution to the long-term Social Security and Medicare deficit. The goal of a bipartisan commission was to solve the U.S. debt crisis in a way acceptable to both parties. On November 10, 2010, Simpson and Bowles pre-released their proposal to much controversy. It proposed a mix of spending cuts, which were supported by Republicans, and tax increases, which were favored by Democrats. It would have reduced the budget deficit to 2.2% of GDP, slightly lower than the final report. On December 1, 2010, the Commission released "The Moment of Truth," its final report. But it failed even to gain the support of enough of its Commission members to pass. It needed 14 Commission members to approve it and only received 11 votes. The divisiveness within the Commission itself meant that Congress wouldn't touch it. Many Republicans had signed a "no new taxes" oath, which left them no room to compromise. In 2011, Congress passed the Budget Control Act. It said that Congress must come up with a deficit-reduction plan. Otherwise, it would face sequestration. That would cut 10% from all discretionary spending programs, including the military. That still didn't force it to agree on a plan, so sequestration went into effect. In 2012, Congress still had no other bipartisan plan to reduce the deficit. It faced mandated spending cuts and tax increases. They threatened to throw the economy off a fiscal cliff in 2013. Congress began to reconsider the Simpson-Bowles plan. But no one was willing to risk their re-election year to support the painful steps required. The Simpson-Bowles deficit reduction plan is a bipartisan strategy that lists six steps to reduce the U.S. debt. It would have lowered the budget deficit to 2.3% of GDP and reduced the debt by $3.8 trillion by 2020. The debt-to-GDP ratio would have dropped to a healthy 60% by 2023 and 40% by 2035. But Congress never adopted it because they were afraid voters wouldn't support it. Tell your U.S. Representatives and Senators if you think they should adopt the Simpson-Bowles debt reduction plan.